Caffeine is the most widely used psychoactive substance in the world. Caffeine has been shown to enhance performance on tasks of sustained attention as well as working memory. Figure 1. Chemical structure of caffeine (1,3,7-trimethylxanthine). Take caffeine in a dosage of 100-200mg at a time. 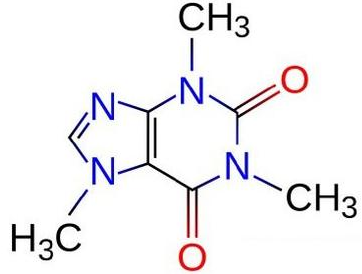 Caffeine can be taken alone or as part of a stack, such as the caffeine + theanine combination. Effects on the brain are outlined below. Caffeine use typically improves attention, as supported by a large number of studies involving dosage amounts ranging from as little as 60 mg to over 200 mg.
Caffeine is well-established as an agent to increase alertness. This effect is particularly noticieable in low arousal situations (after benzodiazepine administration, early in the morning, working at night, during illnesses, and in sleep deprivation conditions.2,3,4,5. in various scientific studies, caffeine consumption has led to increased anaerobic running capacity, increased power output, and improved performance on aerobic exercise. Approved as a dietary supplement component under provisions of the Dietary Supplement Health and Education Act of 1994. Check out this caffeine calculator at caffeine informer to get an estimate of the amount of caffeine safe to consume based on your weight. 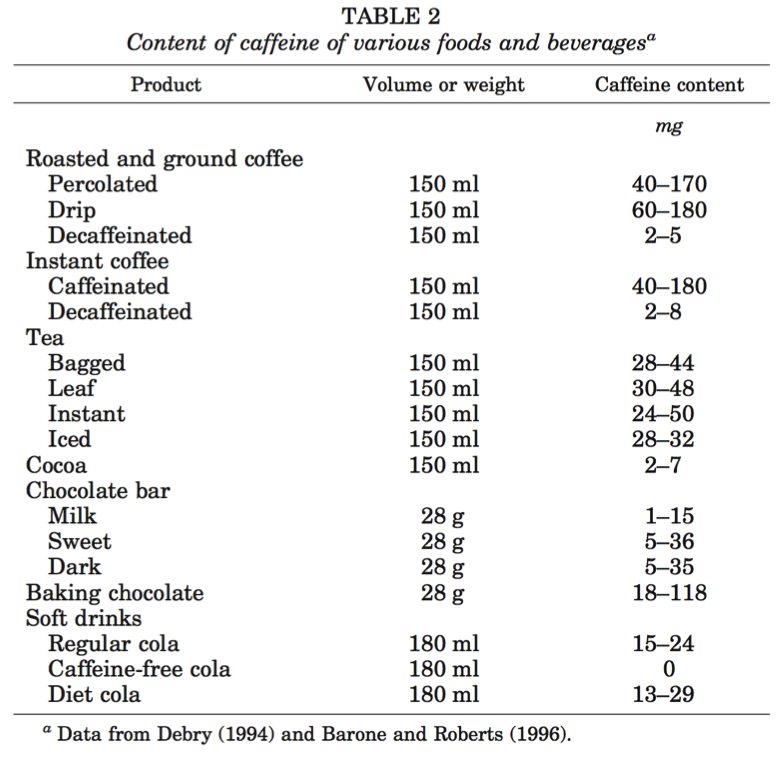 See table 2 for an estimate of the caffeine content in common foods and drinks. Table 2. Caffeine content of select foods and drinks. Johnson, L. C., Spinweber, C. L., & Gomez, S. A. (1990). Benzodiazepines and caffeine: effect on daytime sleepiness, performance, and mood. Psychopharmacology (Berl), 101(2), 160-167. Smith, B. D., Davidson, R. A., & Green, R. L. (1993). Effects of caffeine and gender on physiology and performance: further tests of a biobehavioral model. Physiol Behav, 54(3), 415-422. Wilhelmus, M. M., Hay, J. L., Zuiker, R. G., Okkerse, P., Perdrieu, C., Sauser, J., ... & Silber, B. Y. (2016). Effects of a single, oral 60 mg caffeine dose on attention in healthy adult subjects. Journal of Psychopharmacology, 0269881116668593. Warburton, D. M. (1995). Effects of caffeine on cognition and mood without caffeine abstinence. Psychopharmacology (Berl), 119(1), 66-70. Leathwood, P. D., & Pollet, P. (1982). Diet-induced mood changes in normal populations. J Psychiatr Res, 17(2), 147-154. Morgan, A., & Stevens, J. (2010). Does Bacopa monnieri improve memory performance in older persons? Results of a randomized, placebo-controlled, double-blind trial. The Journal of Alternative and Complementary Medicine, 16(7), 753-759. Smith, A. (2002). Effects of caffeine on human behavior. Food Chem Toxicol, 40(9), 1243-1255. Van Dam, R. M., Pasman, W. J., & Verhoef, P. (2004). Effects of Coffee Consumption on Fasting Blood Glucose and Insulin Concentrations. Diabetes care, 27(12), 2990-2992.